^ McClellan, Ann (2005). 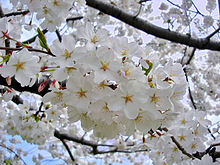 The Cherry Blossom Festival: Sakura Celebration. Bunker Hill Publishing, Inc.. p. 23. ISBN 1-59373-040-3. http://books.google.com/books?id=t2sFUEQQ86AC&hl=en&printsec=frontcover#v=onepage&q=&f=false. ^ Moran, Margaret (2004). Open-Ended Questions Coach: Level D. Triumph Learning - Coach Books. p. 8. ISBN 1-58620-533-1. http://books.google.com/books?id=tH8halDEj-YC&pg=PA8#v=onepage&q=&f=false.